It's an anime --- JK. This is a cheap flash animation. The best thing I can say about it is that the voice acting seems to be well done. The script seems weak or at least untranslatable, and, well, I'm probably not the target audience for the food portion either, since I don't tend to have leftover miso soup lying around that I can throw a tomato at. (Did I mention how cheap the art looks?) Pass. I'm probably going to continue watching this simply because it isn't very long and I like the food preparation tips. Tomato slices with miso? Okay. It seems to be an excuse to teach some basic things about Japanese cooking. Crunchyroll says I need a longer review, but I don't see what else there is to say about JK Meshi. Why watch one episode and then give a show a 1 star review? Most of the reviewers watched the first episode, didn't get it and gave the show 1 star. Yes JK-Meshi is a low budget web-animation, but it's also fun and cute. The premise is simple, in each episode the girls spend about 2.5 minutes making some jokes and doing something together. Then they spend the last minute cooking something very simple. Something any Japanese teenage girl could cook, something even we could cook (if we could get the ingredients). Then they eat it. That's it. It's not great which is why I only gave it 4 stars There are no aliens or zombies or saving the world, just cute girls making easy recipes. And the characters do develop. Educating and entertaining to say the least. 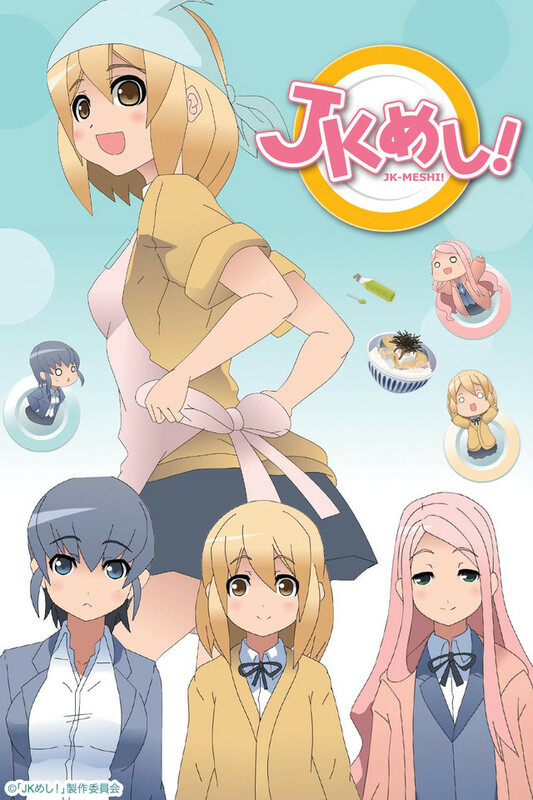 JK-Meshi is an anime about three high school girls studying for tests, talking about school stuff, and having a laugh or two. All while leading up to a very informative cooking segment in the end. This may not be your cup of tea, and that's fine, but I like to base shows on the concept and less about the quality of the aesthetic. The animation itself isn't the best, it looks like it was made in a couple hours with 2-5 unique frames and little personality to the characters, but its also educational as it teaches you not just about history, but about unusual food combinations that are pretty neat and healthy. Overall, i'm enjoying this. Its not the best of the fall lineup, but in my opinion its pretty up there, and a good show to kill time if you have a few minutes. I'll admit, the art style was not what I was expecting and was rather simple. The episode was short, though we managed to learn a bit about each character. The part I actually liked was learning how the dish was cooked and (aside from the tomatoes) thought it sounded actually tasty. Not sure if I'll stay with this one, but I am going to hang around for a bit. Decided to stay with this simulcast after the second episode. While not amazing, both my husband and I genuinely enjoy watching this. The "study" segments are funny and the dishes are interesting enough to try. Like these dishes, this may or may not be to your taste. I found this anime to be surprisingly sweet and intelligent. The girls were talking about real subjects like normal students, and preparing (mostly) nutritional snacks at the same time. I thoroughly enjoyed every episode, despite the less than perfect animation and short episodes. I really hope the creators go on to great things! it's cute, it's dumb, it's fun, and it's a few minutes long. It's a slice of life on a budget, don't go into it expecting something amazing and you'll probably enjoy it too. It's just a few kids sitting around chatting about random school stuff and then they make some snacks. The animation is so bad, the subtitles just seem odd, and there doesn't really seem to be anything to the anime other thing random cooking facts? Maybe it gets better somehow but I have honestly seen better things on like Newgrounds. Avoid at all costs,its not worth the 3 minutes. This is only based on the first episode, but I have no incentive or interest to keep watching for more than the first minute of this.